Britain should not provide a "safe haven" for a Roman Catholic Bishop who has caused tension between the Vatican and Jews by denying the scale of the Holocaust, a leading Holocaust remembrance group said. Stephen Smith of the national Holocaust Centre urged British authorities to monitor Richard Williamson, who returned to Britain on Wednesday after being ordered to leave Argentina, and prosecute him for any comments that incite racial and religious hatred. Pope Benedict angered Jewish leaders and many Catholics last month when he lifted excommunications on Bishop Williamson and three other traditionalists in an attempt to heal a 20-year-old schism within the Church that began in 1988 when they were ordained without Vatican permission. Argentina had cited irregularities in his immigration application and condemned his remarks on the Holocaust as "deeply offensive to Argentine society, the Jewish people and humanity". "The Argentinian government did the right thing by asking Richard Williamson to leave Argentina and publicly denouncing his views on the Holocaust," Mr Smith, who is also chair of the Holocaust Memorial Day Trust, said. "As a British citizen, it is not surprising he is returning home, but the UK must not be a safe haven for him and people like him...We may not have specific legislation to address Holocaust denial but we do have legislation to deal with racist and religious hatred - it needs to be used." 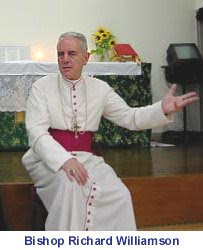 The lifting of Bishop Williamson's excommunication came around the time the ultra-traditionalist conducted an interview with a Swedish broadcaster in which he said there had been no gas chambers. He also said no more than 300,000 Jews died in Nazi Germany's concentration camps, rather than the six million figure that is widely accepted. Bishop Williamson, who has spent the bulk of the past 30 years in Switzerland and the US, before heading a seminary near Buenos Aires, declined to answer questions on his arrival at Heathrow Airport. Argentina is home to one of the world's largest Jewish communities outside Israel. Britain's interior ministry declined to comment on the case. Holocaust denial is not a specific offence in Britain. A spokesman for the Catholic bishops conference of England and Wales said he did not know where Bishop Williamson would go following his arrival in Britain. Bishop Williamson was still not in full communion with the church and did not fall under the jurisdiction of its bishops and would be unable to take up a post in Britain, he added. "The Catholic Church totally rejects the suggestions by Richard Williamson on the Holocaust...and has called for him to renounce them," he said. Bishop Williamson was greeted by a priest on his arrival. Also present was former socialite Michele Renouf who helped Australian Fredrick Toben after he was arrested at Heathrow last year at the request of German authorities for publishing "antisemitic and/or revisionist" material. He was later released. The Vatican ordered Bishop Williamson to retract his comments, but the bishop told a magazine he needed more time to review evidence regarding the Holocaust. World Jewish organisations and German Chancellor Angela Merkel criticised the pope for rehabilitating Bishop Williamson, who belongs to the ultra-traditional Society of Saint Pius X.